Tiles can be made of almost any material. These include porcelain, ceramic, marble, granite and glass. With so many choices it’s often difficult for homeowners to choose the one that’s right for them. Below is some information on each. Hopefully, this will assist you when making your tile-purchasing decisions. CERAMIC TILES are a mixture of clays and other natural materials. Traditional ceramic tile can be naturally coloured and left unglazed (like terra cotta), or they can feature coloured or highly designed surfaces which can be glazed (finished with a glass surface) either in a high gloss or matte finish. Most ceramic tile has either a white or red body coloration underneath the glazed, coloured top layer. Ceramic tiles are durable and fairly easy to maintain. They are also less expensive. Things to note: Heavy glass objects can break easily if dropped on ceramic. Ceramic countertops also crack easily if something like a cast iron skillet falls on it. Also, the grout joints can be very hard to maintain, especially when you are constantly spilling liquids on them. Ceramic countertop grout joints must be sealed at least once a year. PORCELAIN TILES are a newer form of ceramic tile and extremely popular among homeowners. Porcelain tiles are composed of fine porcelain clays and fired at much higher temperatures than ceramic tiles. This process makes porcelain tile denser, less porous, much harder and less prone to moisture and stain absorption than ceramic tiles. For these reasons, most porcelain tiles are suitable for both indoor and outdoor installations. Things to note: Porcelain tiles are harder to cut than ceramic due to their density and hardness. Like ceramic, porcelain tiles have their limits and may become cracked or chipped. MARBLE TILES have an elegant appearance and may first attract you by their beauty. Few construction materials can match the timeless splendour of marble. Marble tiles come in a variety of colours and can complement many different decorating styles, from classical to ultra-modern. Marble is a durable hard stone and lasts a life-time (once maintained properly). Things to note: Like most stone tiles, marble requires high maintenance. 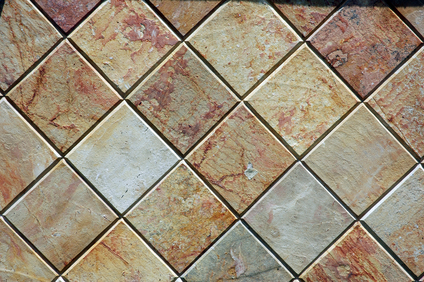 Marble tiles must be sealed and cleaned regularly. Marble tiles need to be polished regularly to properly clean them and to maintain their luster. They are also very costly. GRANITE TILES are quite dense, with a strength similar to porcelain. As an igneous rock, granite is formed under very high heat and has a crystalline structure instead of a layered structure like sedimentary rock. Granite is a hardworking surface and is the most durable of all countertop materials. If properly maintained, granite is stain, chip, and heat-resistant and can last for years or decades. Hot pots can be placed directly on granite, you can cut right on the surface without damage, and spills wipe away easily. The natural stone's elegant beauty appeals to homeowners wanting a classic and chic look. Available in a wide range of colors and patterns, granite can fit into nearly any style home. Things to note: Granite tiles are heavy to install and supporting cabinetry should be strong. The tiles also have limited trim options. GLASS TILES are thin pieces of glass sold individually or as a mosaic, sometimes with other types of tile, on a mesh backing. Glass tiles are colorful, reflective, and easy-to-clean. They are a good choice for backsplashes. Glass tiles come in a wide range of colors and give kitchens a great “wow” factor. Things to note: They can be expensive and difficult to install. Because the tiles are transparent, the adhesive is visible through the tile. You must source an experienced professional for this type of countertop. Glass tiles can chip, scratch, or break with heavy impacts. To find a variety of tiles on thebuildingsource.com click here.